"The target is spotted. We are a go." When universes collide and evil forces start approaching, there's going to need to be resistance. In most cases, that resistance is comprised of individuals with special abilities and a penchant for putting their lives on the line. In the world of Zenescope, those characters are ones many people already know about and they're teaming up in Grimm Fairy Tales 2014 Annual. The issue is written by Ralph Tedesco, illustrated by Andrea Meloni, colored by Valentina Cuomo and lettered Jim Campbell. Sela has taken her role fighting evil as a member of the Realm Knights. She's become a go-to for Shang, who's brought the Realm Knights together in the face of an impending terror in the Dark Horde. Their arrival doesn't bode well for the Realm Knights, especially since they've set their sights on Andre Payne for his unique abilities. It's all adding up to be something that pits good against evil, the latest round of battles for the sake of humanity and its safety. Grimm Fairy Tales 2014 Annual definitely fits into the larger Grimm Fairy Tales universe, even going so far as to bring in all the familiar players. That gives it something that is rewarding to Zenescope fans, as they'll likely enjoy seeing the characters working together. The story blends together all the aforementioned characters for a common cause, but it's not entirely different from some of the other books set in the universe. There's always seems to be some form of impending evil that requires the good players to join together and in Grimm Fairy Tales 2014 Annual the true definition of the evil isn't quite developed. Some of the dialogue feels a little forced, relying on characters over-narrating scenes when no dialogue might have been more appropriate. While the story is a little recognizable, the art style is pretty unique in some ways. Meloni's art is rather simple, but works every well for the content of the book. Characters are shown with strong outlines and basic physical details that accentuate their emotion. Some of the long-distant perspectives are a little muddled though, relying on the reader's familiarity with the character to know who it is and what they're feeling in the panel. Those characters are illustrated with a variety of looks and many of the female characters aren't overly sexualized, which keeps the focus on the story itself. There's an abundance of insets and overlay panels that keep the book moving as well. Grimm Fairy Tales 2014 Annual is another entry in the Grimm Fairy Tales universe that continues to march many of the key players in the direction of a war that transcends worlds. Fans of Zenescope will feel right at home reading the story, while new readers might not have all the context needed to fully grasp what's happening. 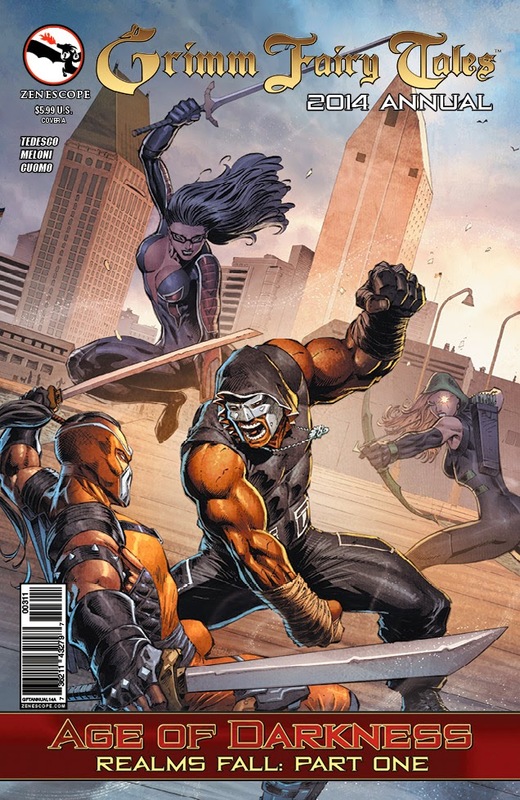 Tedesco is one of the Zenescope originals and has a solid line on the publisher's properties and is a good fit for the script, even if some of the dialogue is a little overly dramatic. Meloni's illustrations are pretty elegant in the simplicity for the most part, but there are some panels where she could use a little more detail. Grimm Fairy Tales 2014 Annual is sort of more of the same while offering something new at the same time. Grimm Fairy Tales 2014 Annual is in stores May 14.